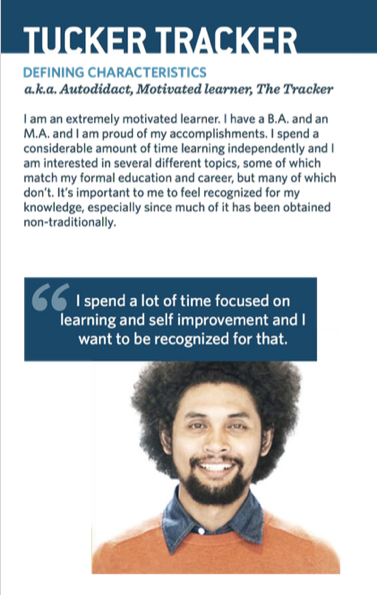 Though in learning now, I started my career in Direct Marketing and Loyalty Card Marketing and Product Development, and I pivoted into HR and led the L&D Technology Products and Implementations for a Fortune 500 Bank. Having to reinvent myself and learn rapidly, I’ve become both fascinated and intrigued at the parallels of marketing and learning. More importantly, I’ve become convinced that L&D could use some marketing love! But what marketers figured out (and where L&D professionals could benefit) was how we used data to get the right offer to the right customer at the right time while delivering an aspirational customer experience. The result? Engaged customers, changed behavior, and customers coming back for more. Everyone in L&D and HR is currently obsessed with employee engagement. This has only been increased by everyone trying to figure out how to capitalize on both digital and social transformations, and their impact on employees, work and the workforce. 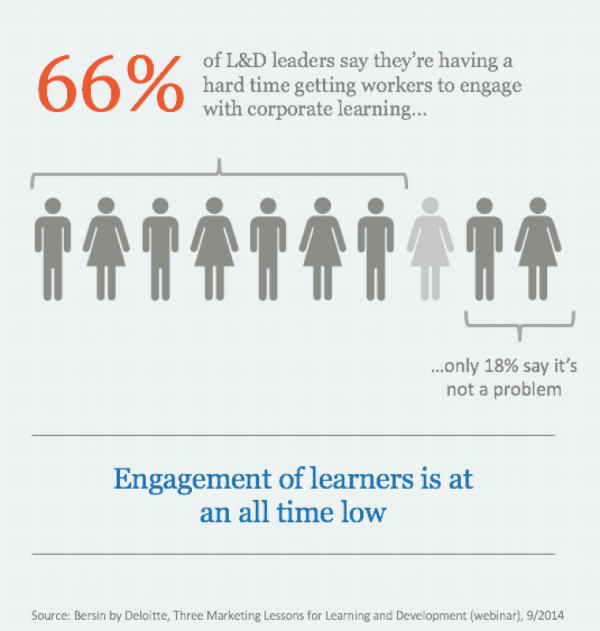 Despite this, nobody is buying what we’re selling in L&D. We need to appeal to our learners, but “appealing” is a marketing problem, not a learning one. Deloitte data says that nearly 7 out of 10 people they surveyed indicated they’re having a hard time getting workers to engage with L&D offerings. I believe the key to achieving success is treating our learners like customers, and then understanding just who they are – the demographics, goals, motivations, frustrations, daily activities, and buying experience/behaviors. You then use that knowledge to cater the message and experience – delivering compelling, relevant offers and products that are meaningful and aspirational. To understand your customers, I suggest you start by creating learner personas by segmenting your learners based on demographics, goals, motivations, frustrations, daily activities, learning needs and touchpoints. Google definition of a Persona: A persona, (also user persona, customer persona, buyer persona) is a fictional character created to represent a user type that might use a site, brand, or product in a similar way. Marketers may use personas together with market segmentation, where the qualitative personas are constructed to be representative of a specific segment. You might have 2 personas, you might have 10. But the goal of a persona is to group your learners into categories around goals, challenges and how they operate. Here are 5 marketing practices you can use to increase engagement after defining your customer. Understanding your customer, the employees, are the key to ensuring you deliver the right experience and get the engagement you expect for your L&D programs and technologies — and a return on your investment. Feel free to check out my recent ATD Webinar on How to Think Like a Marketer. It provides several specific marketing techniques learning practitioners can leverage in their daily work. So, what are you doing to better understand your employees and encourage them to engage with what you are selling? We would love to hear your ideas!